O God of justice and compassion, who dost put down the proud and the mighty from their place, and dost lift up the poor and afflicted: We give thee thanks for thy faithful witness Jonathan Myrick Daniels, who, in the midst of injustice and violence, risked and gave his life for another; and we pray that we, following his example, may make no peace with oppression; through Jesus Christ the just one: who with thee and the Holy Spirit liveth and reigneth, one God, for ever and ever. 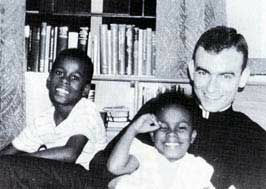 Jonathan Myrick Daniels was born in Keene, New Hampshire in 1939, one of two offspring of a Congregationalist physician. When in high school, he had a bad fall which put him in the hospital for about a month. It was a time of reflection. Soon after, he joined the Episcopal Church and also began to take his studies seriously, and to consider the possibility of entering the priesthood. After high school, he enrolled at Virginia Military Institute (VMI) in Lexington, Virginia, where at first he seemed a misfit, but managed to stick it out, and was elected Valedictorian of his graduating class. During his sophomore year at VMI, however, he began to experience uncertainties about his religious faith and his vocation to the priesthood that continued for several years, and were probably influenced by the death of his father and the prolonged illness of his younger sister Emily. In the fall of 1961 he entered Harvard University in Cambridge, Massachusetts, near Boston, to study English literature, and in the spring of 1962, while attending Easter services at the Church of the Advent in Boston, he underwent a conversion experience and renewal of grace. Soon after, he made a definite decision to study for the priesthood, and after a year of work to repair the family finances, he enrolled at Episcopal Theological Seminary in Cambridge, Massachusetts, in the fall of 1963, expecting to graduate in the spring of 1966. I lost fear in the black belt when I began to know in my bones and sinews that I had been truly baptized into the Lord's death and Resurrection, that in the only sense that really matters I am already dead, and my life is hid with Christ in God. I began to lose self-righteousness when I discovered the extent to which my behavior was motivated by worldly desires and by the self-seeking messianism of Yankee deliverance! The point is simply, of course, that one's motives are usually mixed, and one had better know it. As Judy and I said the daily offices day by day, we became more and more aware of the living reality of the invisible "communion of saints"--of the beloved comunity in Cambridge who were saying the offices too, of the ones gathered around a near-distant throne in heaven--who blend with theirs our faltering songs of prayer and praise. With them, with black men and white men, with all of life, in Him Whose Name is above all the names that the races and nations shout, whose Name is Itself the Song Which fulfils and "ends" all songs, we are indelibly, unspeakably ONE.